I came to Roach's music indirectly and still probably don't have a really good grasp of it. 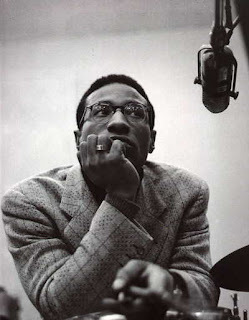 I think I first became familiar with his work, on record, through the recordings he did with Mingus around '57, some of which were issued on a Prestige twofer that I bought early on in my jazz listening years. Then, of course, there was the great, great "Money Jungle". I never acquired much classic bop, it being readily available and often played on KCR, but his drumming in those contexts always stood out for me. I remember Mingus saying that he could walk into a club and if Roach was in the middle of a solo, he could tell what the piece was; his playing was that melodically precise. I was fortunate enough to see him six or seven times. The first was in duo with Abdullah Ibrahim at Environ in, iirc, 1977. Annoyingly, I can't really recall details of the show (except that Richie Havens was in the audience!). Sometime in the early 80s, I made my one and only call-in for a ticket giveaway on KCR. The DJ said to name the drummer and played "The Hard Blues". Ah the late, great Philip Wilson. The prize was tix to see Roach perform with the World Saxophone Quartet at St. John the Divine in upper Manhattan, a cavernous, amazing space. There was an oversized bass drum positioned front and center of the playing area, horizontally. To begin the show, Roach appeared, grasping a thick, wooden club. He raised it over his head and brought it down on the drum with significant force, then just stood there for about 15 seconds listening to the reverberations die away. He did this a few times as members of M'Boom! filed in behind him to begin their set. The collaboration with WSQ was wonderful; don't know if it was ever recorded. Saw him several times in the 90s with his quartet, his double quartet and otherwise. For a while, we were friends with a close friend of Roach's daughter, Maxine, and would go to see them when they played in town. My condolences to Maxine, who was lovely and charming the one time we met. My strongest memory, though, is of a brilliant concert that took place on a sunny afternoon behind the Brooklyn Museum, a duo with Randy Weston. The duo itself was as supremely musical as you would expect from these two but what sticks in my mind is the brief solo set Roach did to open the show. Playing only snare drum, he performed three or four "songs" with as much musicality as you'd normally hear from a saxophone or piano. Just a jaw-dropping event. Obviously the end of an era, but also the passing of one of the supreme musicians of the last century. Thanks for all the beautiful music, Mr. Roach. there is a live bootleg of that m'boom show and it is wonderful. i'd be happy to share it. Dennis Gonzalez has been trying to get that M'Boom show for a while; I'll email him to see if he still hasn't found it. Weston/Roach sounds like a magical combination; envious, that would be me. I saw Max's quartet at least a couple times and, except for Max, it was less than inspiring. In fact, having heard recordings of Odeon Pope subsequent to that, it's hard to believe it was him. But Max was outstanding; obviously somebody very sure of his position in musical history but not content to rest on his laurels. Unfortunately he serves as an example of keeping very active musically is no guarantee to ward off Alzheimers. If you mean the show with WSQ, sure I'd love to hear it, thanks very much! Drop me a line at: bolewnick at verizon dot net. Lars, baby! I want the M'Boom bootleg! I need it!